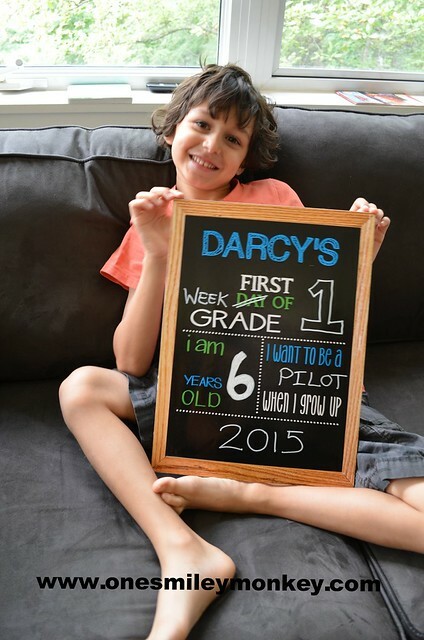 My big kid started grade one this year and I thought it would be fun to order one of those premade signs that records their grade, age and future ambitions. When I got the sign I was instructed to purchase a white chalk marker. I had NO idea what that was! Luckily a week or so later I received a fantastic package of Chalkola Chalk Markers, which included not only the white marker that I needed but a whole array of amazing neon coloured markers as well. Chalkola Chalk Markers are wet erase markers that can be used on any non-porous (this is very important) surface such as craft paper, windows and blackboards. They are also eco friendly, non toxic, Xylene-free and odor-free. They wipe off easily with a wet cloth or a little spray of window cleaner. I found the colours to be very concentrated and incredibly vibrant. I can see these being great for school or classroom projects as well as home crafts. I had no problem wiping everything off with damp paper towel and I was really impressed that they really did have the look of chalk. There are some huge benefits to using this type of product over regular chalk, the most obvious being that there is no dust involved, which makes them infinitely cleaner. It also says on the packaging that it washes easily from clothing, but luckily I didn’t have to test that claim. However, if true, this is also a step up from traditional “washable” markers that I find don’t always actually wash out of clothing! I also think that since it is held like a regular marker it is much easier to control and therefore, much easier to write or draw with, which should appeal to children and adults alike. Note that the packaging instructs the user to shake the marker and press up and down on the tip multiple times before use, I would say it took a good 30 seconds of pressing up and down on the marker before the colour saturated the tip and I knew it was working. That being said, once I realized how many times I had to do it, it was easy to get the rest of them going. The package I received comes with 10 chalkboard markers in bright neon colours and retails for $21.77 USD on Amazon. This makes a great gift for the craft person in your life or a perfect gift for your child’s teacher or librarian. 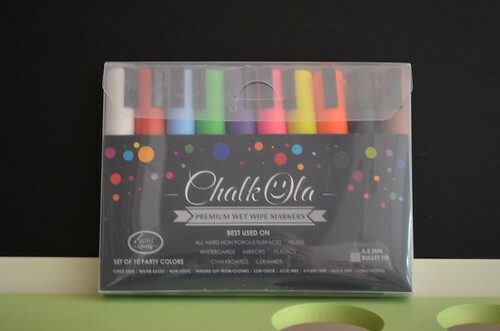 Win it: One lucky US/CAN reader will win a pack of Chalkola Chalk Markers. So fun! Enter to WIN via Rafflecopter below. Good Luck! I was gifted product for review consideration, however all opinions and views on this post are 100% my own. I would use them to create a masterpiece with my kids. I’m from BC and I’d use it for our daily schedule board! A message board to be shared with the family! I would use them for our family communication board and also let my kids draw with them. So cool. Oh, I could think of so many things! These would be perfect for labeling and my menu board! We would use these for arts and craft projects. I would use them with my kids for our weekly schedule board and crafts. I would use it for a stocking stuffer for my daughter. She’d use them on her easel. I would use them for our family calendar the most. I would you use the Chalkola Chalk Markers for music practice. My youngest son would love to use them on his whiteboard to help with writing his letters. My daughter would use them to draw. She loves to draw. We would mostly use them for drawing. Love these markers! The board for your kiddo is adorable! I would use them to create wall art with my daughter! I would use them for my monthly calendar! Thank you So very much! We’ve got a message board hung up, but they would be great for prepping photo props too! We would use them on our chalkboard schedule planner. We would use them for our kitchen message board and crafts! These look like fun. My daughter would use these on her dry erase board in her room. I want to do a chalkboard wall in my kitchen to keep track of shopping lists and menus. We would use them for arts and crafts mostly. Arts and crafts! My daughter has a chalk board on the end of our cupboard and these would be great for it! I think we would use it to practice our alphabets! Oh gosh I would love these in our house! We have a wall chalkboard in our main area that my oldest daughter uses for drawing on for important occasions – first day of school, last day of school, birthday, Halloween etc. She draws a picture and prints her name and the date, then I take a photo of her underneath it – we have a whole series of commemorative photos that we love to look at to compare her changes in height, looks, drawing skills, printing skills etc. We just have plain chalk and sometimes it is hard to see in the photos, plus it is dusty. These would look so much better! I like them for the sign idea. Would be great when my daughter starts school next year. But, I think my daughter would want to use them too to draw. I homeschool my children, so I would definitely use these awesome chalk markers on our chalkboard! My oldest daughter would enjoy drawing with them as well. I’d use these to decorate our windows for holidays! My kids would probably use them for school most on our chalkboard. We would use them to decorate the windows come the holidays. I love having the windows all decorated. I would use them for making items for my photography so people portraits could be even more special. My almost 5 year old would love to use these on her easel chalkboard! The kids would use it draw and stuff. I would use it for my daughter, to make signs, for her birthdays and other events, and to just play with. I would give them to my nephew’s daughter to do her artwork. We would use them for learning and drawing pictures. I’m thinking about doing a short wall in the kitchen with chalk board paint. These would be fun! My kids love to surprise Dad with a decorated driveway to come home to. My kids would use them for drawing in their sketch books ???? They would be great for craft projects. We have a chalk board in our kitchen and these would be awesome to use on it!! I would use the Chalkola Chalk Markers for crafts the most. These would be great for doing arts and crafts with my kids. 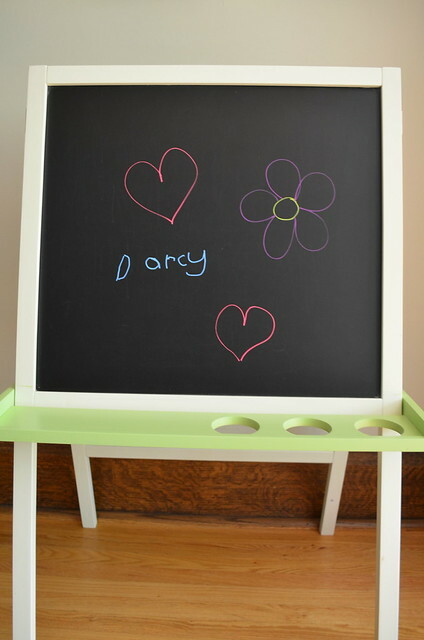 We have a chalkboard easel in my kids’ playroom and I’m sure the kids & I can come up with some masterpieces!